- War: What is it Good For? - Whatever Happened to Christmas? - Who Is This Jesus? 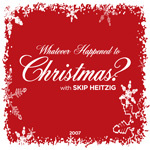 In this series, "Whatever Happened to Christmas?" by pastor Skip Heitzig, we are discovering why Christmas is so special and why it is important to celebrate its true meaning. There is a clear difference between Christmas traditions and the truth, between the historical and the hoopla, and between fantasy and reality. Through this series we'll determine the distinguishing truth behind this special celebration. Discover what God's plan is for the world and find out how He would have us celebrate the greatest of all the holidays!